Marcel Lohbeck, Managing Director of the Association for European Inland Navigation and Waterways in Duisburg (VBW, Germany) and Dr. Wolfgang Hönemann, German Representative of the Port of Rotterdam and chairman of VBW’s working committee on transport economics shared with Danube SKILLs partner, VIA DONAU, their experience related to VBW initiatives for fostering modal shift to inland waterway transport. Could you please inform the readers of this interview about the tasks that are carried out by VBW and the geographical area that your organisation covers? Which international initiatives does VBW engage in to foster a modal shift to inland waterway transport? VBW works closely with national and international branch organizations on crucial issues such as the improvement of infrastructure quality, the ecological development of the inland fleet, the integration of IWT into digitalized supply chains. VBW is also a member of several EU und CCNR working groups. 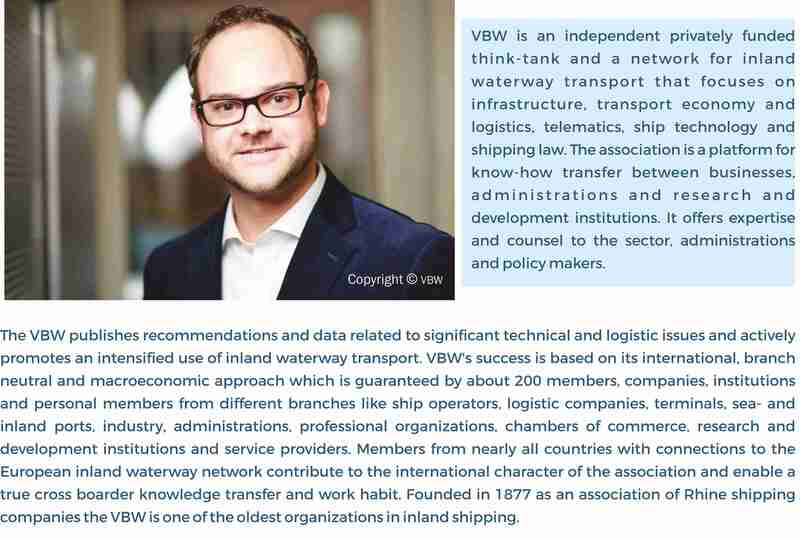 Which kind of services and promotion actions does VBW offer to actively promote inland waterway transport (IWT) in the relevant industries and business sectors? Our members gain access to a unique independent international branch and expert network. They get the chance to meet new potential business and project partners. At our best-practice-days, workshops and seminars and through the plenary sessions of our working committees they benefit from knowledge of VBW-experts and take part in an international exchange of information and experiences. Members receive exclusive data collections and publications about relevant issues for your business but also information on important future trends and upcoming issues on the topics: logistics, law and technology. Our members are part of a broad and cost-efficient alliance for the promotion of inland waterway transport. Through working within the VBW-network members have the chance to contribute significantly to setting practical legal and technological standards.